Now, a few years later, (I won’t tell you exactly how many) I am married to a Frenchman (not from the mountains but no-one is perfect) who thankfully shares my passion for skiing and snowboarding. We are now experiencing the pleasure of passing on this love of all things cold and white to our 2 children. Having experienced some crazy times as a chalet girl, some totally unforgettable ski holidays with friends and now, more recently, family ski holidays, I really cannot say which is the best ! All I can say is that I hope for everyone, including my children, that they get to experience what I have experienced in my « ski life » ! After skiing for the first part of my « ski life », I then discovered the joys of snowboarding. After one week of falls and frustration, I finally got the hang of it and didn’t look back until my kids started learning to ski! Don’t ever try to hold a 3 year old on skis between your legs when you’re snowboarding – it very obviously doesn’t work ! So now I have rediscovered the joys of skiing and often hang back to help out a stranded snowboarder on one of those fatal flat roads !! Considering it is almost impossible to ski ALL year round, I did the next best thing! Work in the ski business! Having worked for a large online tour operator for several years, I am now proud to say that I am responsible for the snowplaza.co.uk website, in particularly our fantastic blog! The team is growing and you will see we have been joined by Gareth another avid skiing loon! As I now live in France, I am lucky enough to be able to visit French ski resorts very easily – some within only a two and a half hour drive - Vars, Risoul and Serre Chevalier are among my favourites in the South. This means I manage to stay up to date with what’s happening on the slopes all through the season. I hope you enjoy reading my articles and don’t hesitate to leave comments to let me know what you think ! 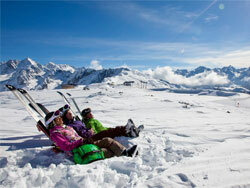 Family ski holidays - what really happens in a week up the mountains!